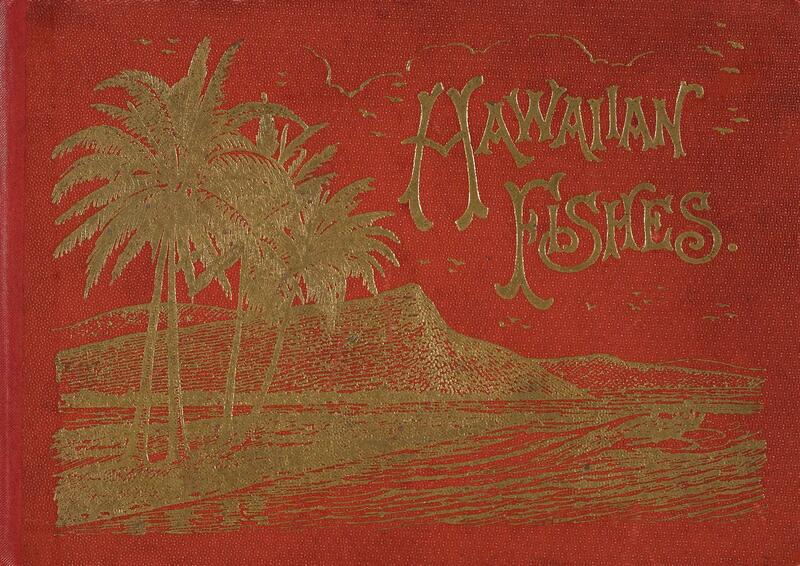 Hawaiian fishes is a diminutive book in our Joseph F. Cullman 3rd Library of Natural History, but its flashy red cover with gilt lettering certainly catches the eye. The interior, 12 plates of flamboyant tropical fish, is just as engaging. The book certainly piqued my interest when it was featured by the Biodiversity Heritage Library in social media posts last week. 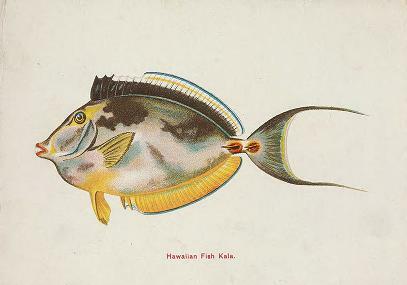 Illustration of “Hawaiian Fish Kala” or Bluespine unicornfish. It was produced by the Island Curio Company in the very early 20th century, about 1905-1910, as a keepsake for the newly built Honolulu Aquarium (now the Waikīkī Aquarium). It offered visitors a fun and educational way to take home a small piece of their Hawaiian vacation. Constructed with an accordion fold, the plates could even be pulled out in one long strip. The accordion-folded plates in Hawaiian fishes. The plates in this little book weren’t the only ones created by Jordan and Evermann. 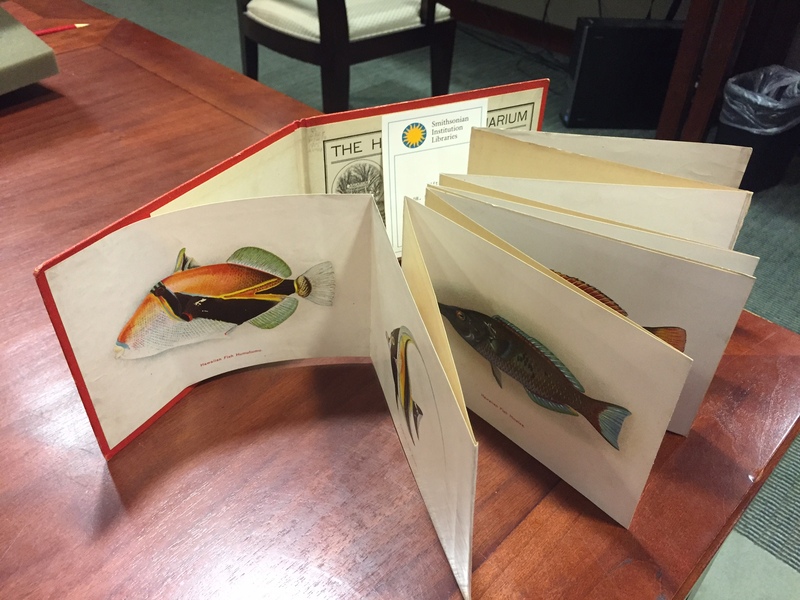 Were there even more gorgeous illustrations of these Hawaiian fish in our stacks? Off to the Fishes Library I went in search of Jordan and Evermann’s initial tome, The aquatic resources of the Hawaiian Islands , Part 1: The Shore Fishes. It is a scientific work attempting to document all of the known fish species in the area as of 1902. The 12 plates reproduced in Hawaiian fishes were just a sampling – Jordan and Evermann’s scholarly title contained 72 colored plates, which the authors carefully noted were “painted from life, the specimen in each case having been placed alive in a specially constructed aquarium and the work completed before the colors materially changed.” Though originally painted in oil or watercolor, the prints in the book are lithographs. These meticulously colored plates were in addition to over 200 black and white illustrations in the volume. It’s easy to see why such beautiful illustrations were re-purposed by the Island Curio Company for a tourist’s keepsake. 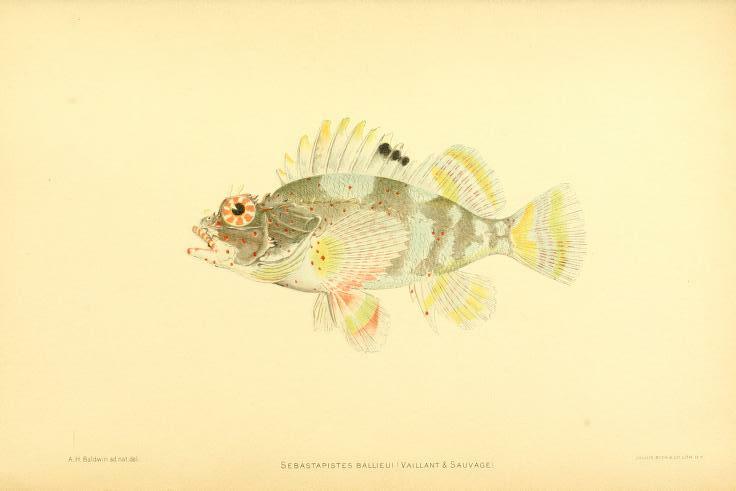 Sebastapistes ballieui or spotfit scorpiofish in The aquatic resources of the Hawaiian Islands. Compared side-by-side, the illustrations in Hawaiian fishes jump off the page a bit more than those in The aquatic resources of the Hawaiian Islands, maybe because the enhanced colors made for better gift shop sales? 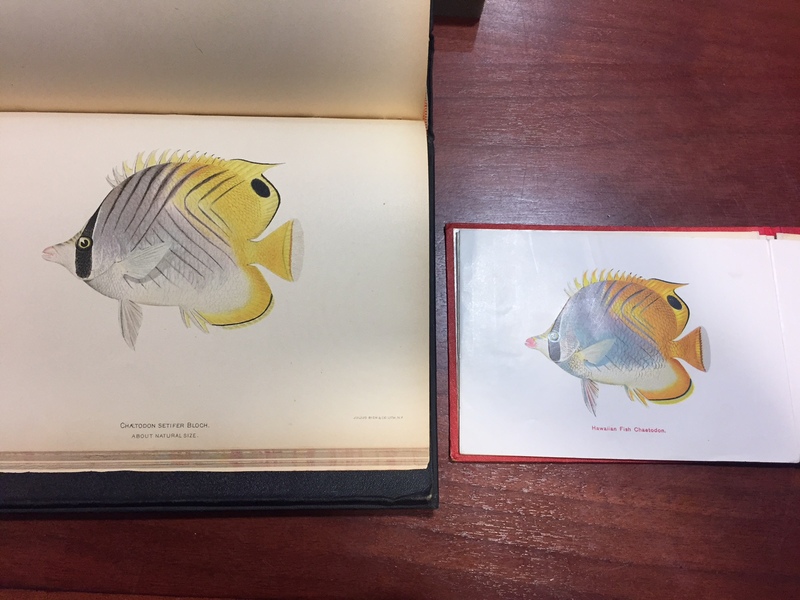 While you may not be able to bring home a copy of Hawaiian fishes from your vacation this summer, you can peruse both souvenir and scientific versions of Jordan and Evermann’s fish illustrations, regardless of your travel plans. 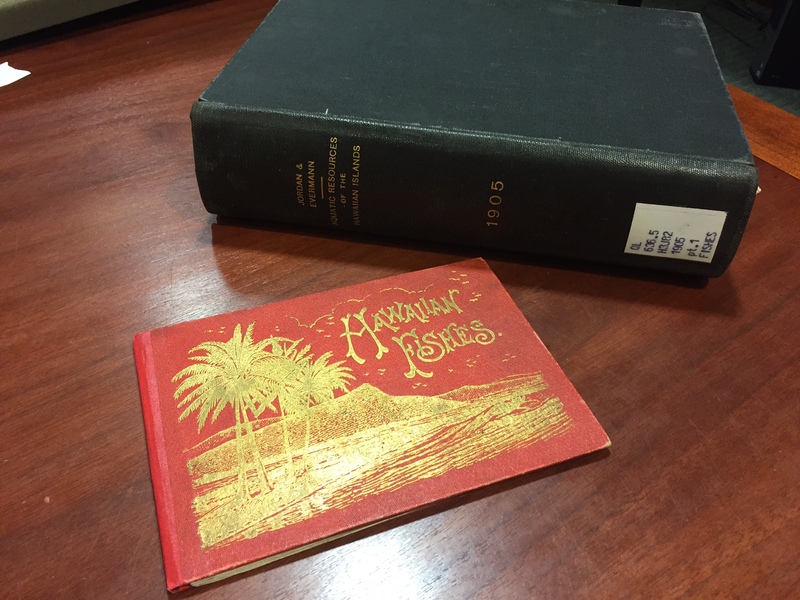 View Hawaiian fishes and The aquatic resources of the Hawaiian Islands in the Biodiversity Heritage Library. Chaetodon auriga or threadfin butterflyfish in The aquatic resources of the Hawaiian islands (left) and in Hawaiian fishes (right). Hawaiian fishes and The aquatic resources of the Hawaiian islands.